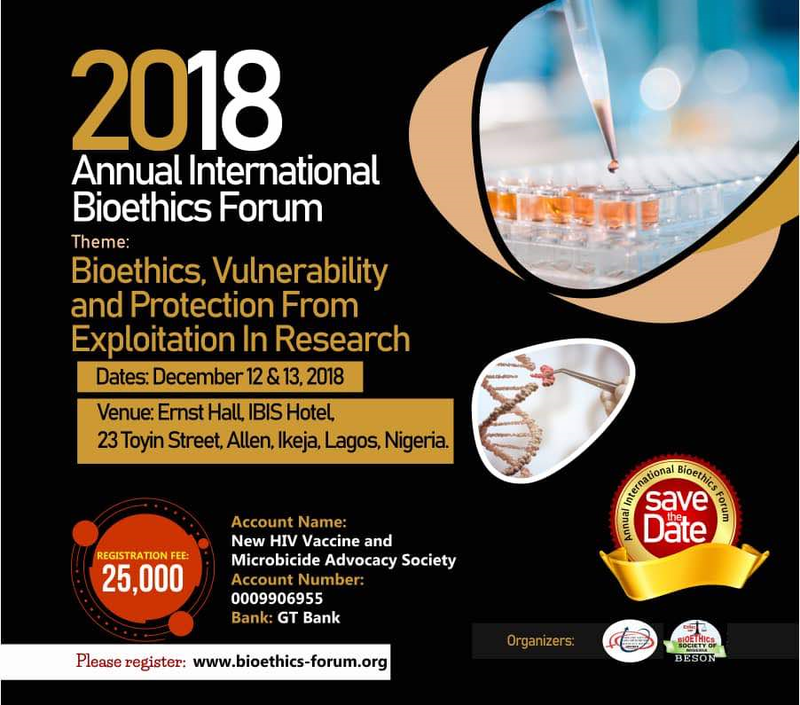 The Nigeria-based New HIV Vaccine and Microbicide Advocacy Society in collaboration with the Bioethics Society of Nigeria will be holding a two-day forum on bioethics, vulnerability and protection from exploitation in research. The forum will take place in Lagos, Nigeria on 12 – 13 December 2018. The Annual International Bioethics Forum provides opportunity for researchers, bioethicists and members of ethics committees (ECs) working across Africa to learn the latest science, research and bioethical issues that will inform their work and practice. The 2018 Forum will be the third in the series, and, as previously, will feature cutting edge presentations renowned international speakers and participation from diverse groups and individuals, including the academia, IRBs and ECs, civil society and NGOs.